DUBLIN—Two of the Pool rounds have now been completed and the 3rd and final round will be played in Dublin later today. In the 2nd round last Sunday Aug 13, Hong Kong met the mighty Black Ferns of New Zealand and suffered a 121-0 defeat. This follows their baptism into matches at this level against Canada the previous Thursday which ended 98-0 to Canada. The scores sound horrendous but watching the second half of the New Zealand match, Hong Kong put up a commendable performance, good tackling, good defending, always in the game and occasionally making ground towards the opponents line. They did not look out of place on the field. But strong attacking play by their opponents created gaps through which they were able to score. There was one period early in the second half when Hong Kong were actually putting pressure on the Ferns and occasionally looked like they might score. This shows that they have the capability at the top level, but breaking through to score is still a big hurdle. They have one more Pool game to play which is against Wales later today (Aug 17) and it would be good if they could get on the scoreboard. Hong Kong’s match, or matches in Belfast later in the month, are likely to be for one of the bottom places and should give them a chance to showcase the improvements that they have made in this tournament. It’s tough at the bottom but it is also tough at the top. To gain a place as one of the top 4 teams they need to be in the top 4 positions after completing the Pool matches, With three Pools and six contenders points difference in the Pool matches is likely to be important. This means that the top teams have to score as many points as possible in their pool matches, so there is no time to relax. In Pool A, New Zealand are on 10 points and Canada have 9 points, and both have massive points differences that are unlikely to be caught (Wales and Hong Kong will be down the order). In Pool B, England and USA are both on 10 points (Italy and Spain will be lower down the order), and in Pool C, France have 10 points with Ireland on 8 points (Australia and Japan will be down the order). There are big, crunch matches to be played today (Thursday Aug 17). In Pool A, New Zealand take on Canada and Wales play Hong Kong; in Pool B, England play USA and Italy play Spain; and in Pool C, France play Ireland and Australia play Japan. So in each group the two stronger teams play and the two weaker teams play, the results of which will determine positions for the final playoff s in Belfast starting on Aug 22. 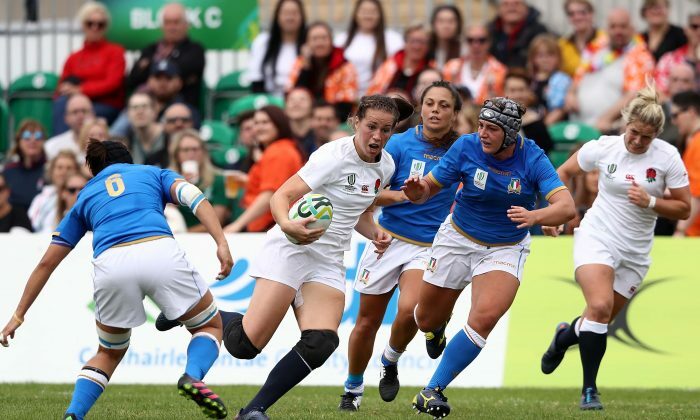 The results of the last Pool matches saw wins for England against USA (47-26), New Zealand to Canada (48-5), France to Ireland (21-5), Spain to Italy (22-8), Australia to Japan (29-15) and Wales to Hong Kong (21-15). USA scored a last minute try to give them (what they thought at the time) was an important bonus point. Had Ireland continued their successful campaign to beat Pool C leaders France, France and USA would both have finished with 11 points and the final semi-final place decision would have come down to match points difference. But in the later match Ireland lost their match with France leaving USA as the clear 4th team for the semi finals, joining New Zealand, England and France. Playoffs for the lower order positions will also be contested in semi-final groups for places 5 to 8, and for position 9 to 12. Each team will play 2 matches in the playoffs. Hong Kong put up a good performance against Wales, and although losing 15-39, were well in the game, particularly in the first half. Natasha Olsen-Thorne made history by becoming the first try scorer for Hong Kong in a World Cup match – Hong Kong went on to score 2 more tries in the match. The Playoffs will take place from Aug 22 to Aug 26 in Belfast.